Perennial, creeping, ground cover, which roots at the nodes, as it spreads over the ground. Leaves, from 2-4cm wide, and kidney-shaped, with a v-shaped slot, where the leaf joins the stem: often with serrated margins, which gives them the appearance of miniature fans. Size of leaves can depend on climate, season, soil structure, fertility and growing position: whether in sun or shade. Small-sized leaves usually hug the ground and have a short petiole stem; however, large leaves can have a petiole up to 20cm long. When plants are grown in the shade, they tend to have large leaves and very long petioles. This petiole stem can have a pink/purple tinge. Pink flowers 5mm across, usually set 2 to 4, side by side, as an umbel, developing from the stem nodes. 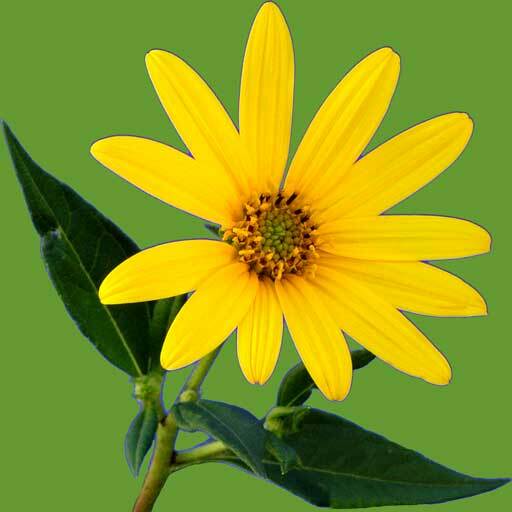 Flowers are so small (and often hidden underneath leaves) that, generally, the flower is not noticed at all. It is only under a microscope that the flower’s beauty is seen. Although gotu kola belongs to the umbel family of plants, now classified as Apiaceae, there is very little resemblance to other umbel plants: like parsley, dill, fennel and coriander. Seeds, of gotu kola, form in flat, oval capsules, usually containing two tiny, brown, kidneyshaped seeds. Sometimes, gotu kola is mistaken for Swamp Pennywort (Centella cordifolia); as its name suggests, it does like to grow in damp places. The leaves of this species can be slightly longer than broad, with sinuate or faintly crenate margins and minute, purple flowers. There are numerous other ‘look alike’ plants, that people have often brought to the herb farm to have identified, such as Kidney Weed (Dichondra repens), a herb with creeping roots, petiolled kidney-shaped leaves with scalloped margins; a traditional Chinese herb for fevers, dysentery, jaundice and to remove excess fluid from the body. Native Violet (Viola hederacea) (see p 342) similar size and shaped leaf, to gotu kola, with scallops, but both ends of the leaf tend to overlap, near the stem, and it bears lavender and white non-fragrant violets. Coast Pennywort (Hydrocotyle bonariensis) which has a creeping root; the leaf-stem is attached to the centre of the leaf with broad, scalloped margins. It is believed to have been introduced into Australia, from South America, where it has had traditional use for urinary disorders and as an antiinflammatory. Alehoof (Glecoma hederacea) a hardy, creeping, ground cover, with dainty, kidney-shaped leaves and crenate margins: these can be used as salad greens, medicinally for colds and as a liver tonic (see p 23). Other plants that have a visual resemblance to gotu kola are several Ranunculus species, which have similar leaf formation; and other Hydrocotyle species. Before using gotu kola, it is important to make sure that it is the correct plant. I remember, several years ago, when a lady told me she had been using the native violet for some time, thinking it was gotu kola. She said “No wonder I was not getting rid of my arthritic pain”. Gotu kola has been known for centuries, valued for treating leprosy and tuberculosis; relieving the pain of rheumatism and arthritis; to increase brain capacity; and for longevity, often being called, the elixir of life. 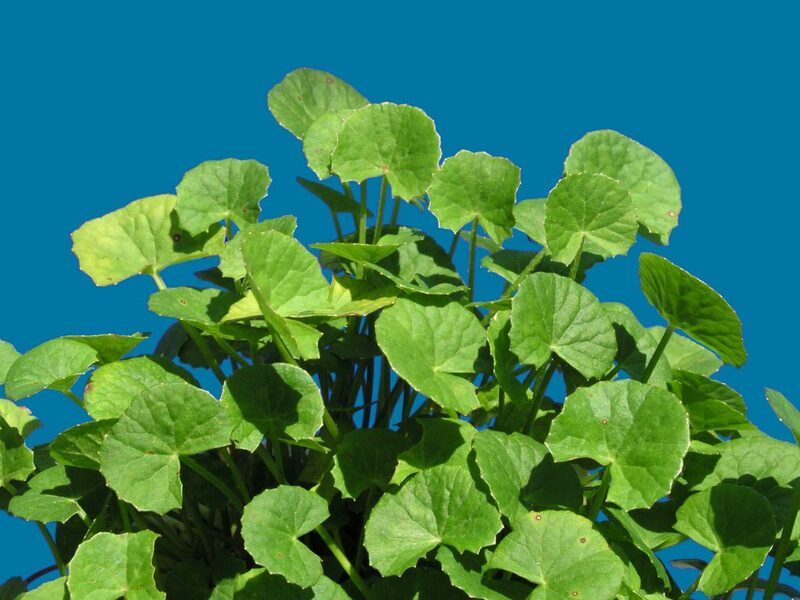 A legendary saying, in reference to gotu kola was: ‘2 leaves a day, keeps old age away’. In Sinhalese culture, they valued the herb to strengthen and revitalize worn out bodies and brains; eating 2-3 leaves a day to bring about a gradual return to health and strength, provided that the body is exposed to the sun, for a time, each day. In Ancient China, the herb was a principal ingredient in an elixir called ‘fo ti tieng’, a mixture that was called the fountain of youth. Many herbalists have called gotu kola: the finest of all herb tonics. It appears, they say, to have no equal in the treatment of general debility and decline. Digestion is strengthened (no doubt aided by the bitter properties) and food better utilized, with the process of overall metabolism, increased. Gotu kola has been called ‘a pharmacy in one herb’, offering impressive benefits. In India, gotu kola is a traditional remedy for skin conditions, wounds and bruises. With controlled tests, in which an extract of gotu kola was applied, to 20 people, suffering with slow healing wounds: 64% of the wounds healed completely and 16% improved considerably. At Sydney University, research on wound healing is being carried out, following invitro studies on the herb. It is one of the most important, rejuvenating herbs in Ayurvedic medicine, particularly valued for: revitalising nerve and brain cells, promoting calmness and clarity, helping poor memory and lack of concentration, increasing meditation ability and to help balance the left and right hemispheres of the brain. Valued as a brain food, for improving intelligence and reflexes, it has been a herb students have used for: renewing mental alertness, clarity, and energy levels, without the ‘jitteriness’ some people may experience with coffee. It can be used throughout life. Gotu kola contains neither caffeine, nor theobromine. It was the life history of the renowned Chinese herbalist Professor Li Chung Yun, who lived to the age of 256 years (having outlived 23 wives) which made the western world aware of the true value of herbs for longevity. Herbs he recommended, most highly, were gotu kola and ginseng. He was born in 1677 and in 1933 the New York Times announced the death of this remarkable Oriental, whose life span had reached over two and a half centuries. The Chinese Government officially recorded his age. Professor Li, at the age of 200 years still gave courses of lectures for 28 weeks at a time, each lecture on longevity lasting 3 hours, at a Chinese University. Those who learned from him, declared that he did not appear older that a man of 50, standing straight, strong and had his own natural teeth and head of hair. Besides recommending life-extending herbs, his lectures gave clear-cut guidelines, for those who wished to enjoy a long life. He stressed; one should never be in a hurry … take it easy … take your time. He taught his students to sit as calmly as a tortoise, walk as sprightly as a bird, and sleep as soundly as a dog. He advocated avoiding extremes of emotion of all kinds, especially as a person grows older, as nothing drains energy from the body as rapidly, or disrupts the functional harmony of vital organs, as completely, as stress or strong outbursts of emotion. Daily physical exercise and deep breathing was important, as also was a simple, primarily vegetarian, diet; and on hot, summer nights, over-eating should be avoided (as it causes stagnation of the blood and lowered energy). On cold, winter mornings, extra quantities of nourishing foods should be eaten, to provide the extra essence and energy the body required, for keeping warm. It is said that in the Orient, where gotu kola is primarily regarded as a herb for longevity, there are many recorded examples of unusual longevity, attained by those who used the plant, regularly. Elephants seek out gotu kola as a favourite food. Could it be that the strength of the animal, the unfailing memory and its long life, are due to regular consumption of the herb? After Li Chung Yun’s death in 1933, numerous research projects explored the properties of gotu kola and undertook various trials, with wound healing, duodenal ulcers, to enhance memory skills, tumours, etc. In India, scientific documentation of clinical tests, by Dr.M.V.R. Appa Ras and his associates, showed increased mental activity of children in the trials. Fifteen, mentally retarded children were given a 500mg tablet of powdered gotu kola daily. After trials of three months, the children showed increased powers of attention and concentration, considerably above that of the fifteen children in the placebo group. Results also showed significant increase in IQ (4.6%), general ability, with improved behavioural patterns and expression, communication and co-operation. Biochemical studies revealed, gotu kola benefited the replacement rate of biogenic amines: the chemicals in our brains which act as neuro-transmitters, involved in learning and memory process. Gotu kola has always been known as a remarkable herb with a multitude of uses, and of special benefit for chronic, degenerative diseases. As one of it’s common names implies, ‘Indian Ginseng’, it is similar to ginseng in its actions. 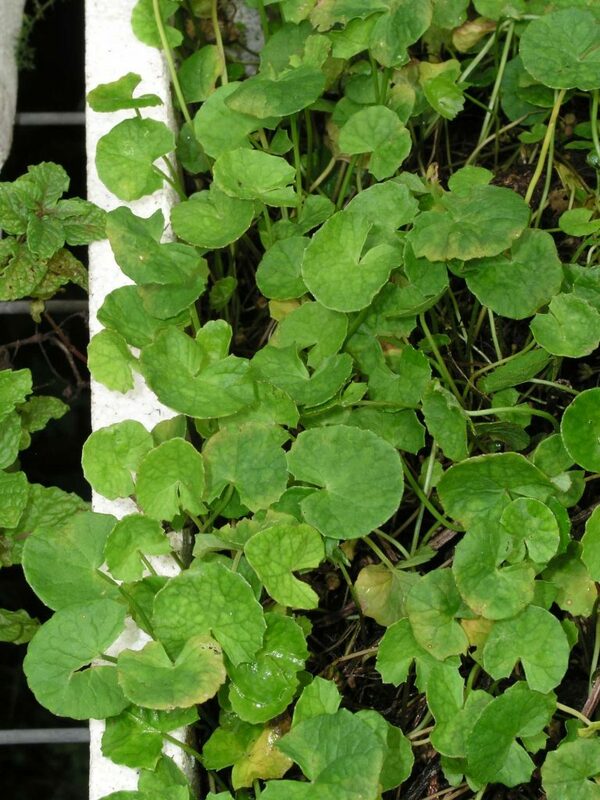 In fact, some herbalists regard gotu kola as highly as ginseng, and more affordable: besides, it is easy to grow. Note, gotu kola is not Withania somnifera, which also has the common name of Indian ginseng (see p 141). I always find it most interesting, when I dig a plant, that may be 3 to 5 years or more of age, that the root has a resemblance to ginseng root, and to the torso of the human body. This indicates a doctrine of signatures significance, of ‘like cures like’, a herb which benefits so many ailments of the body. poor appetite, atherosclerosis, depression, skin ulcers, urinary tract infection, candida, tuberculosis, mental retardation, sexual debility, elephantitis, fibrocystic breast disease, gastric, hypochondria, ankylosing spondylitis, skin ulcers, failing eyesight, abscesses, mouth ulcers, for impotence, stomach upsets, bruises, scleroderma, herpes, cramps, exam tonic, lupus, bowel disorders, fluid retention, hepatitis, swollen glands, intestinal worms, convulsions, surgical wounds, dermatitis, joint mobility, bowel disorders, anemia, hardening of, arteries, tingling in legs, to stimulate the liver,, bladder, kidneys, stimulate central, nervous system. Many people have been able to correct high blood pressure, with consistent use of the herb. Research from the U.S. National Institute on Ageing, showed that high blood pressure can lead to atrophy and shrinkage of the brain. The study also showed, that: years of high blood pressure raises the amount of a liquid, known as cerebrospinal fluid, inside the skull, and lowers the amount of white matter. Who wants less white matter? Gotu kola’s constituents have a strong blood purifying action, and help to lower serum cholesterol levels; this could be mainly due to the action of Beta-sitosterol. The plant saponins help the function of the immune system, by assisting in breaking down the walls of diseased cells, making microbes easier to kill. It seems likely, that it is this same action that has been seen in research, which works to kill the leprosy bacteria by dissolving the waxy, protective substance around the bacteria. Over twenty years ago, my herbal mentor shared with me the benefits of gotu kola to relieve arthritis. As I did not suffer with arthritis, myself, I could not speak from experience of the benefits. However, I did share this information, when I was asked to speak to groups, in lectures, and for people who came to learn at the farm and in herb courses. Over the years, I have had outstanding feedback from people who tried it and experienced relief from pain. They also shared this information with friends, and people in pain whom they met. There was always a steady stream of people visiting the herb farm, … “for the plant that could relieve arthritis” and gotu kola became the most called for herb. Doctors recommended it to their patients. People ordered it be posted to their aged parents. Friends told friends, who had fingers crippled with arthritis. Arthritis has been recognised as the single, largest and identified cause of disability and handicap in Australia, now affecting over 2.6 million people. It is an inflammatory condition of the joints (which can be of the fingers, wrists, elbows, shoulders, hips, knees, spine and toes) with symptoms of pain, swelling, stiffness and deformity. It may appear suddenly or come on gradually, with a toothache-like pain or sharp burning or grinding pain. There are many different forms arthritis can take. Osteoarthritis, a degenerative joint disease is related to the wear and tear of ageing, and involves the deterioration of the cartilage, at the end of the bones. The once-smooth cartilage becomes rough, resulting in friction; tendons, ligaments and muscles, holding the joints together, become weaker, and there is severe pain, stiffness and deformity. Rheumatoid arthritis, an auto-immune disease, is inflammation affecting the synovial membranes. Cartilage and tissue, surrounding the lubricating fluid in the joints, can be destroyed. The body replaces this damaged tissue with scar tissue, causing the spaces between the joints to become narrow, to develop folds and to fuse together. There is stiffness, swelling, anemia, weight loss, and often crippling pain, with loss of mobility to carry out normal activity, which means the quality of life becomes greatly reduced. Gout can be classed as another form of arthritis, which attacks the smaller joints of the feet and hands, depositing crystallised uric acid salts in the joints causing swelling, redness, a sensation of heat and extreme pain. People, who wished to be free of these painful, debilitating diseases, have taken the herb. After a period of weeks to months, they usually experience a lessening of pain and disability: some report a complete cure. 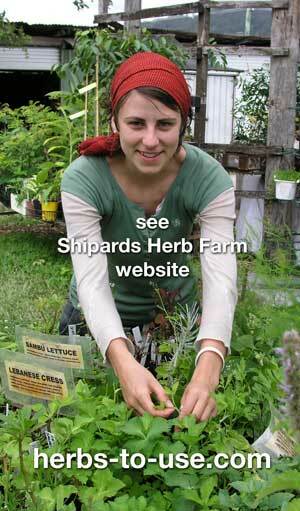 Many years ago, I was teaching a herb course at the TAFE College. In the first week, I took into class a box of gotu kola plants, to ask if there might be someone in the group suffering with arthritis, who would like to use it daily, and report back their experiences at the end of the 6 weeks. Immediately, a lady indicated she would like to trial the herb. At the end of the course, she excitedly shared with everyone in the class, that she did not feel fatigue like she used to at the end of the day. This was despite a heavy schedule, with a busy and demanding business, and that she felt more relaxed and the arthritic pain was gone. For years, she had not been able to take the rings off her fingers because of swollen joints, but after taking gotu kola for several weeks, was able to remove her rings again. A retired gentleman heard about gotu kola, from his wife who came to do the herb course. He was sceptical, but decided to try it, anyway. To his amazement, after 10 days, his swollen, arthritic hands felt a loosening and ease of pain. He called around soon after, to share this with me: lifting his arm above his head, and waving it around with ease, something, he said, he had not been able to do for a long time. Recently, a lass called for gotu kola, which she wanted to give to a friend of 22 years of age, who had severe arthritis. She knows it is effective, as previously when she was nursing, she met a lady of 102 years who ate it daily. If this centenarian did not eat the leaves regularly, she would have arthritic pain back again. Many people have shared with me, how they have been relieved of arthritis by chewing a couple of leaves of gotu kola, daily. Some people experience benefits within several weeks. For others, consistent use for 3 to 12 months has given results, and for a few people they found they needed to build up to 5 – 6 or more leaves, before they felt a lessening in symptoms. Note, that a two-leaf-daily dose, refers to leaves the size of a fifty-cent piece, so if the leaves are smaller, more leaves need to be taken to give the same amount. Knowledge is powerful, particularly when it comes to knowing what gotu kola may achieve. 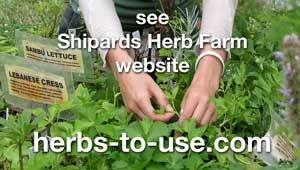 A man heard me on ABC radio, ‘Herb of the Week’ program. He was most interested, as he had suffered with very swollen, painful wrists, for a long time, and all drugs prescribed, gave no improvement. He found some gotu kola, used it, and four weeks later, his wrists were normal in size and free of pain. A lady, in Victoria, ordered some plants to be sent by post, as she was desperate to get some relief, from the rheumatoid arthritis that had crippled her for 25 years. She described the pain she was in as: ‘hell’. She also suffered high blood pressure. After 2 weeks of using the leaves, nearly all pain was gone, her blood pressure had normalised and she could sleep almost the whole night, through. Another lady rang, desiring relief from her arthritic condition, which had virtually made her wheelchair bound. Her hands were deformed like claws; she could not write. Massive doses of cortisone had done little to relieve the intense pain, nor had any other treatment she had tried. She started to cut up the leaves, that I posted to her, with a parsley chopper and had a good pinch of dried, chopped leaves on her muesli, each morning. Within a short period of time, she was free of pain and back riding her horses, and, as long as she takes the herb daily, she has no pain. If she runs out of leaves and goes without, even for a few days, the pain returns. A security guard suffered with severe arthritis, and in the mornings, could hardly move. He started eating 2 leaves a day and, after a short period of time, he was entirely free of pain. Another person, after 2 weeks on the herb, found total relief from pain. He shared his findings with a friend, who could hardly lift a cup of tea. The friend experienced relief in 3 months and was able to lead an active life again. A man, who had prostate cancer, was told about gotu kola. He started eating leaves, each day, with amazing results: he no longer had the problem. A man, who was a professional bike rider, was struck down by severe arthritis and could not ride, anymore. He took gotu kola for several weeks with amazing pain relief and was then able to ride again. Gotu kola has been life-enhancing for many people, and that is why I am sharing this knowledge with you. So many people, have shared with me, how valuable gotu kola has been in their lives. There is an old proverb that says … ‘when someone shares with you, something of value, and you derive a benefit from it, you have an obligation to share it with others’. Will you also, help to share this knowledge, so that others may be relieved of pain? For many people, gotu kola has made life worth living, again. I have shared these true-life incidents, to encourage other people suffering pain, that pain, chronic or otherwise, may not need to be part of their lives. And, what could be simpler than eating a couple of leaves each day?